Churned butter milk. Suitable for vegetarians.Our pikelets are light and airy, made with traditional buttermilk The Pikelet brings out the best of a crumpet and a pancake. It was first developed by the Welsh as a regional variation of the Crumpet in the early 17th century and later spread to the other areas of the North. Unlike crumpets, our Pikelets are not contained in rings when cooked on the griddle resulting in a thinner, more freeform shape. 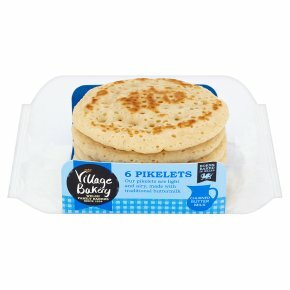 The distinguishing little holes give the Pikelets a soft texture and make perfect little pockets for butter and jam.